ProStop Brake Drums are precision engineered to meet or exceed OEM performance specifications. 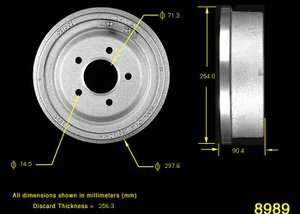 Cast to OEM design & SAE J431/G3000 metallurgical specifications. The Pep Boys Say: "Brake drums should be resurfaced or replaced with every brake service."